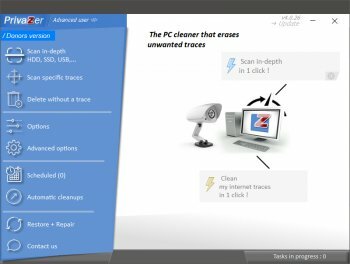 PrivaZer cleans your PC in-depth and removes unwanted traces of your activities at home or at work. You can see what can be recovered of your past activities and securely clean traces to get a PC PrivaZer cleans your PC and your external devices. PrivaZer is a smart cleaning tool that helps you master your security and freedom, free up disk space and keep your PC fit and secure. PrivaZer still removes the right click "Clear Recent Items option"
I still have the Recent Items but I no longer have the right click "Clear Recent Items option" it is gone until I use the system restore. Pretty good. Not bad. Can't complain. Classic Shell Menu uses Quick Access and the recent file list maintained by Windows. If you want to preserve those lists, simply open PrivaZer, in the scan lists, click on "Start, Jumplists, Quick Access", then click on the "Options" link and in the Jumplists list, uncheck both "Windows Explorer" and "Quick Access". why does it Kill Classic Menu recent file list?? @darkwzrd1 you are an idiot! I have a dally backup and the issue is not fixed..
you hide behind the internet you are a true coward! I'm just saying that's easily fixed. All everyone does is make fun of you, your a L.O.S.E.R, who isn't respected by anyone. Stop embarrassing yourself! You do realize that issue can be resolved without a reinstall? Your truly computer illiterate. Stop installing applications you don't know how to use. It's far,far more than a reg cleaner, it cleans traces from browsers, free space MTF & more, a good companion to CCleaner & worth getting the donors version. I do not see an option for Classic Menu in the ini! PrivaZer does more harm than good! I presume because you choose to delete it in the options. Great program & always evolving - Worth donating as the donors version is better & other extra improvements on the way, but free version still good.